Enjoy your retractable awning while you still can! Then you’ll have to begin winterizing it to preserve its longevity. Fall is here, and with it, your time out on the deck or patio may be coming to end soon. You’ll definitely want to savor the last few days you have, but it’s also a good time to start thinking about preparing your retractable awning for the winter months. Winterizing your awning is an important part of regular awning maintenance that will ensure its longevity for years to come. Follow these tips as you begin your preparations for winterizing your awning. An essential part of winterizing your retractable awning will be making sure that it is thoroughly cleaned so that any dust or other debris doesn’t set in on the fabric and frame. Brush off any loose dirt and debris from the fabric. Then use diluted dish soap and a soft bristled brush to gently clean the awning and wipe down the frame. Visually inspect your awning for any signs of mildew and clean it as soon as possible – there are products out there that can help clean off mildew stains and restore your awning to its proper state. Inspect your awning fabric for any tears and have them repaired before the winter sets in. Small tears now can cause big problems after the winter. Generally, repair kits can be obtained from the awning manufacturer, but you can also find various solutions online if this isn’t possible. The first heavy frost of the season will be your tip to start preparing for winterizing your awning. 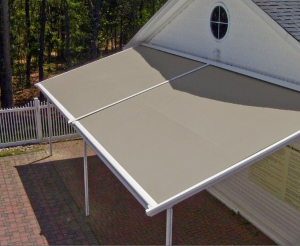 However, you could cause undue damage to your retractable awning if you’re not careful. Don’t try to extend your awning while it is covered with frost as it could damage the fabric or the motor. Wait until the frost is completely thawed before using it. In addition, during the winter, make sure you keep your awning cover and motor clean, clearing off any snow and ice buildups. Melted snow and ice can damage your awning. You may also want to consider removing and storing your awning and valences for the winter if that is an option. Ready to get the perfect awning for your business or home? Carroll Awning Company has the expertise and equipment to make and install the perfect residential or commercial awning to give your home or business an even cooler exterior. We can design, create, and install custom canopies and awnings all year long. For a free estimate and to get started designing your dream awning, give us a call at 1-800-999-5617 or visit us online. To see examples of our work, follow us on Facebook, Twitter, Google+, and LinkedIn.